During the Indiana University trustees meeting this afternoon, students literally turned their backs on the administrators, lackeys, and bigwigs, in order to hold their own assembly. Thirty people took over a third of the conference room to discuss their conditions and frustrations (including debt, powerlessness, the closing of the women’s office, and environmental destruction), and begin proposing methods of struggle between themselves. Having few illusions regarding the value of “dialogue” with professional liars, the focus was on self-organization and exposing the illegitimacy of the power of the trustees. As the meeting went on, the trustees appeared increasingly disconcerted until they could no longer effectively carry on conversation and left. Luckily, despite heightened tensions with the many IUPD cops stationed there, no arrests occurred. 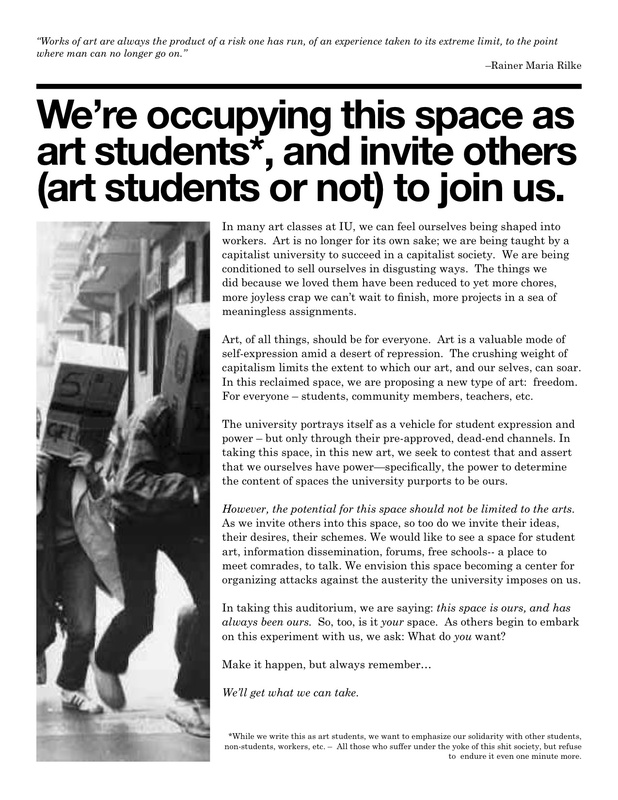 A communiqué posted widely on campus after the disruption.